Biography of American Portrait Painter of George Washington. Founder of Hudson River school. 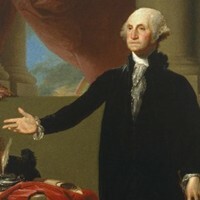 One of the leading figures in American Colonial art (c.1670-1800), the Rhode Island artist Gilbert Stuart is regarded, along with John Singleton Copley (1738-1815), as one of the best portrait artists in eighteenth century America, and the creator of a distinctively American style of portrait art. It is one of Stuart's portraits of George Washington that still circulates on the American dollar bill, today. During his career, Stuart painted more than 1,000 portraits, including the first six Presidents of the United States. But he was more than just a painter of the Founding Fathers: he set the standard for much of American art to come. His greatest portrait paintings can be seen in the best art museums throughout the United States, including the National Gallery of Art Washington DC, the Frick Collection and the Metropolitan Museum of Art in New York City, and the Museum of Fine Arts in Boston. Born in Rhode Island, Stuart moved with his family to Newport at the age of seven, where his talent as an artist first became evident. Taught painting by Cosmo Alexander, a Scottish painter, he was only 12 years old when he painted the famous portrait of Dr Hunter's Spaniels, which still hangs in the Hunter House Mansion in Newport. By the age of 14 the young prodigy was regularly accepting commissions. In 1771, accompanied by Alexander, he sailed for Scotland, to complete his studies. However, in 1772 his teacher died, leaving Stuart the impossible task of earning a living as a painter in a strange country. The following year he returned to Newport. The outbreak of the American War of Independence prompted Stuart, like Copley, to seek refuge in Britain. After graduating from Glasgow University, he settled in London where he became a pupil of Benjamin West, the expatriate American artist, who famously described Stuart as having the skill to "nail a face to the canvas." Under West's tutelage and guidance, Stuart began exhibiting at the London Royal Academy as early as 1777. One of his early masterpieces was The Skater (1777, National Gallery of Art, Washington DC), a work of cool colours combined with flawless portraiture. By the early 1780s, Stuart - who had married well - was recognized by his contemporaries as second only to the English portraitists Joshua Reynolds and Thomas Gainsborough, and far more talented than his American colleagues, with the exception of Copley. Although his reputation was fully reflected in the high fees paid by his sitters, Stuart's capacity for spending was even higher. In 1787, in order to escape his creditors, he was obliged to flee to Dublin, Ireland, where he continued as both portraitist and spendthrift. Returning to America in 1793, he settled briefly in New York City before setting up his studio in Philadelphia, Pennsylvania. It was here that he quickly established himself as the country's foremost portraitist, with his paintings of rich and successful Americans, including the first six American Presidents. George Washington first posed for Stuart in Philadelphia, in 1794. Based on that sitting and a number of follow-ups, Stuart executed more than 100 portraits in three basic designs. The most famous of these, known as the "Athenaeum", is the image which currently appears on the United States one dollar bill. Despite painting some 130 copies of this portrait, Stuart failed to complete the original version (1796), which now hangs in the Museum of Fine Arts in Boston. Stuart's second type of Washington portrait is known as the "Lansdowne" portrait (1796, Pennsylvania Academy of Fine Arts, Philadelphia), a copy of which hangs in the East Room of the White House. The third basic design is called the "Vaughan" portrait (1795, National Gallery of Art, Washington DC). Almost every US State has a copy of a Stuart portrait of Washington hanging in their state capitol. In addition to George Washington, Gilbert Stuart also painted the portraits of the next five Presidents including John Adams (2nd), Thomas Jefferson (3rd), James Madison (4th), James Monroe (5th), and John Quincy Adams (6th President). Stuart's oil painting is notable for its strong characterization, and fluent brushwork. He imitated none of the Old Masters, preferring to rely on what he saw with his own eyes. He had a great talent for flesh tones, which he obtained by using a wide variety of colours, but he did not mix the pigments: instead he allowed each colour to shine through the subsequent layer, as in a transparent skin. Unusually, he worked without the aid of sketches, drawing directly upon the canvas. In 1803, Stuart opened a second studio in the nation's capital Washington, to cope with the demand for portraits. In 1805, he moved from Philadelphia to Boston where he continued to attract widespread acclaim and great financial success. However, he remained dogged by debts due to his financial profligacy. In 1824, he suffered a stroke, which left him partially paralyzed, although he continued to work until his death in Boston, four years later. In 1930, his birthplace in Saunderstown, Rhode Island was converted into the Gilbert Stuart Birthplace and Museum. Paintings by Gilbert Stuart can be seen in many of the best art museums throughout America.  For more biographies of American artists, see: Famous painters.  For more information about portraiture, see: Homepage.